How often do you trade in your smartphone for a newer, shinier model? If you’re like most people, your old gadgets are banished to a junk drawer or similar locale that’s full of old cell phones, cables and cords you know you’ll never use, but aren’t entirely sure how to dispose of. A United Nations study reports that 44.7 million metric tons of e-waste were generated worldwide in 2016, which is expected to increase by 17% to 52.2 million metric tons by 2021. That’s more than 115 billion pounds of e-waste. So, instead of letting your old cell phones, TVs and computers continue to take up space in your home—or worse, tossing them in the trash—why not responsibly recycle your old electronics? While you’re busy deep-cleaning your entire house this spring, don’t forget to clean out your collection of old or unused electronics too. We tend to take our gadgets for granted without understanding what goes into them. Just look at a smartphone. It has a crystal-clear LCD touchscreen made from glass, liquid crystalline and plastic, which is derived from crude oil. Its circuit board reads like the periodic table of elements, boasting rare earth metals like copper, cobalt, gold, palladium, tungsten, silver and platinum. It has a rechargeable lithium-ion battery. Plus, it’s packaged using paper from trees, more plastic from crude oil and aluminum from metal ore, and shipped to the store, which uses more fossil fuels. That’s a lot of resources to go into something you may use for a couple of years, only to toss into the trash and send to a landfill where it’s incinerated, pumping damaging emissions from toxic materials into the atmosphere, harming human health and the environment. 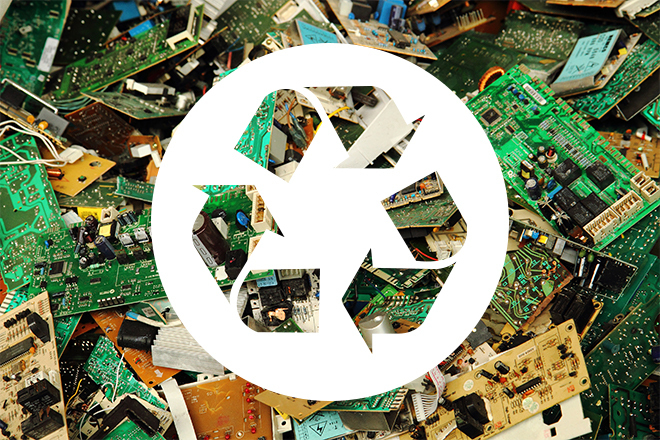 When electronics are disposed of properly, with human health and the environment in mind, their materials can be extracted and turned into new products. Your community may offer collection days a few times throughout the year. Contact your city hall to see if there are any recycling events on the calendar. Call2Recycle has drop-off locations throughout the country where you can recycle old batteries and cell phones. Simply enter your zip code at Call2Recycle.org to find a drop-off location near you. You can also find drop-off locations and events in your state by visiting Sustainable Electronics Recycling International or TIA E-cycling Central. The EPA’s website has a handy directory that allows you to find recycling locations by device, store or manufacturer. Apple GiveBack allows consumers to recycle any Apple devices, including devices from Apple-owned brands such as Beats Electronics. Donate your devices by dropping off items in-store or by using a prepaid trade-in kit. You could earn up to $1,000 credit toward the purchase of a new product. If your device isn’t eligible for credit, Apple will send it to a recycler that will extract precious metals and other resources. Office Depot and Staples will give you $2 when you recycle ink and toner cartridges, with some restrictions. Companies including HP, Epson and Canon also offer recycling programs. Best Buy has responsibly disposed of more than 1 billion pounds of electronics and appliances, according to their website. They accept three items per household per day at any of their stores, and you can recycle everything from digital cameras to dishwashers, with some restrictions. Best Buy will even recycle your old appliances with the purchase of a new product. Mobile carriers like AT&T, Sprint and Verizon allow you to trade-in or recycle your old devices. The Amazon Trade-In program gives customers an Amazon.com gift card in exchange for thousands of eligible items, including Kindle E-readers, tablets, Bluetooth speakers, gaming consoles and textbooks. If you want to responsibly dispose of a used computer, smartphone, tablet or other pieces of old technology equipment that contain personal data, be sure that it's completely wiped of sensitive information. Terminate your service if you don’t plan on continuing service for the item you are recycling, such as a cell phone or cellular-connected tablet. Back up your device by copying files to an external hard drive or computer, if applicable. Microsoft offers instructions on how to back up a device running Windows, and Apple has recommendations for backing up your Mac device. Wipe your device. This may be an option under your device’s settings. However, the Department of Homeland Security says this isn’t enough. They recommend that Windows users download DBAN or Eraser. Apple has instructions on how to wipe devices on their website. Remove any batteries, if possible, as they may need to be recycled separately. Springtime is always a great time to declutter and get rid of the stuff you no longer need, and that goes for old, unused electronics too. With a little research, you can find the information you need to responsibly recycle your gadgets and keep them out of landfills. While you’re refreshing your home this spring, don’t forget to refresh your insurance policy either. Now is an ideal time to revisit your homeowners insurance policy to make sure you’re adequately covered. For more information, including how you can save money by bundling your homeowners and auto insurance policies, contact your local Personal Express agent by calling 1-800-499-3612.